Enterprises and small-to-medium-sized business environments alike face escalating data storage needs. In many situations, that data must also be archived to meet compliance requirements. 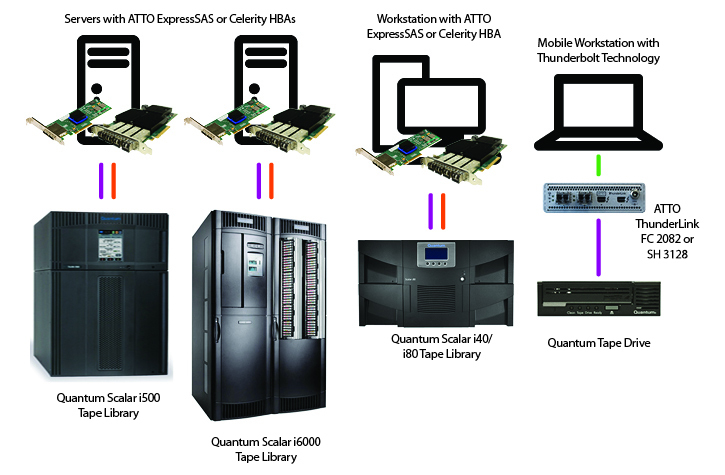 Quantum Scalar™ Tape Libraries provide a scalable, reliable, low-cost solution for long-term data storage. When used in combination with ATTO ExpressSAS® host bus adapters (HBAs) or Thunderbolt™ connectivity products, they benefit from low-latency, high-bandwidth workstation connectivity to ensure consistent data transfers. Advanced Data Streaming Technology (ADS™) latency-management technology is built into every ATTO HBA and RAID controller, providing the fastest, most consistent time-to-data, delivering the best-in-industry aggregate bandwidth and predictable data transfers for high-performance applications.